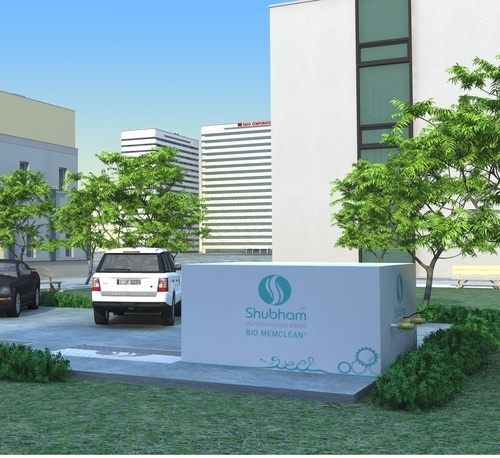 Shubham’s Package Sewage treatment Plant is totally self-contained, covered, single piece packaged treatment system for onsite wastewater treatment. Package STP’s are innovative and truly versatile systems for the effective treatment of wastewater, including Nutrient removal. The Membrane Bio Reactor (MBR) is a biological system coupled with a membrane to enhance solid-liquid separation and filtration. The membrane is made of cost-effective non-woven fibrous material. It has many outstanding properties, such as controllable pore sizes and easy fabrication of the membrane module to achieve the desired surface area. The MBR can achieve desired permeation rate at low transmembrane pressure. An MBR can best be described as one part of a biological process where small microbes degrade pollutants before being filtered by a collection of submerged membranes. Membranes are housed in modules that are, in turn, assembled into cassettes and installed in a tank (called an MBR). Air introduced through integral diffusers scours membrane surfaces during filtration, mixes the tank and provides oxygen to the biological process. An MBR system is a complete set of components that allows a process to function. Assuming the same reuse and quality effluent and similar solids management goals, an Enviroquip MBR system can be 50% less complicated than a comparable conventional wastewater treatment plant and require less than 25% of the footprint (land area). Idea for sites where water reuse is premium. Advanced environmental protection equipment to achieve quality discharge. Plan capacity is Expandable with addition of MBR Modules. High Resistance to Hydraulics and shock load. Available in Concert and steel tanks. Image | This entry was posted in Sewage Treatment Plant and tagged ahmedabad, Baroda, Effluent Treatment Plant, Effluent Treatment Plants, Grey Water Treatment, Modular STP, Rajkot, sewage Treatment Plant, STP, Surat, Waste Water Management Company, Wastewater Treatment, Water Softening Systems, water sources, Water Treatment, water treatment Plant, Water Treatment Plant Manufacturers, Water Treatment PlantLeave a comment, Water treatment processes, Zero Liquid Discharge. Bookmark the permalink.